Following recent events in Charlottesville, as well as in our library itself last spring, the Vassar College Libraries staff, not surprisingly, sought understanding through our collection. 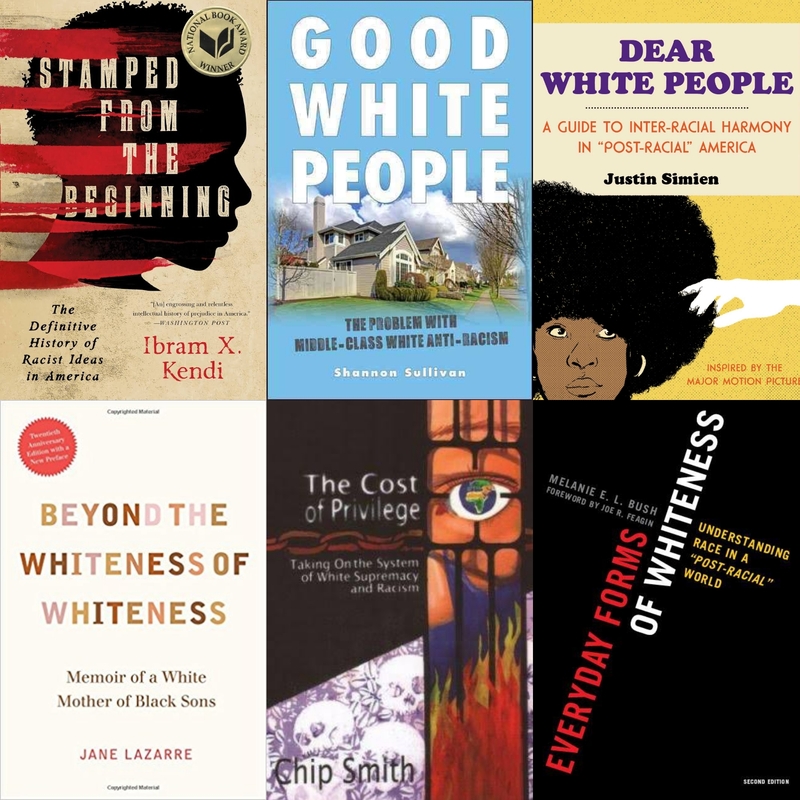 The result is the Charlottesville Primer, a list of books and movies dealing with white supremacy, the history of whiteness, and their impact on our current society. Library staff selected these particular books and movies because they were thought provoking for us as we meandered through our own library looking for books on this topic, but there are many, many more sources that can be added to the list; the titles below serve only as a “seed list” that we hope will foster thought and conversation. All the books and movies in the Charlottesville Primer are located in the Browsing Collection in the lobby of the Thompson Library. This is not the first time we have turned to literature and art to explore the topic of race after disturbing national events. Just two years ago we participated in the Charleston Syllabus following the murder of nine parishioners gathered for a prayer service at the Emanuel African Methodist Episcopal Church. We have linked to that syllabus HERE and you can read Assistant Director of the Library for Collection Development and Research Services Deb Bucher’s thoughts at the time HERE. Both the list and Deb’s essay remain relevant in the aftermath of Charlottesville. We invite you to join this ongoing conversation on Tuesday, September 26th at 4:30pm in the Library lobby as part of our adLib series. An event series that pairs the interests of librarians and students in programs that inspire curiosity and build relationships, adLIB intends to engage the spirit of spontaneity and curiosity to encourage Vassar students to cultivate genuine interest in the Libraries’ extensive collections, supportive services, and informative people. adLIB programs are casual, informal opportunities for students to discover and explore possibilities in our libraries that can be applied in the academic world and beyond. Wells-Barnett, Ida B. 1892-1900. On Lynchings. 2002 ed. Amherst, NY: Humanity Books. A collection of three smaller works: Southern Horrors (1892); A Red Record (1895); Mob Rule in New Orleans (1900). DuBois, W.E.B. 1920. Darkwater: Voices From Within the Veil. New York: Oxford, 2007. This collection contains the essay “The Souls of White Folks,” which is an examination of the “assumption that of all the hues of God whiteness alone is inherently and obviously better than brownness or tan…” (p.). Malcolm, X. 1971. The End of White World Supremacy: Four Speeches by Malcolm X. Edited by Benjamin Goodman. New York: Merlin House. Representative speeches of Malcolm X’s thinking between 1962-1963, laying out the hypocrisy of White, liberal, America and arguing for strong, Black leadership. Brown, Kathleen M. 1996. Good Wives, Nasty Wenches, and Anxious Patriarchs: Gender, Race, and Power in Colonial Virginia. Chapel Hill, NC: University of North Carolina Press. This book examines the role gender–especially the regulation of white women’s sexuality–played in the creation of racial categories in colonial America. The author focuses on the Virginia colony and uses court records, promotional tracts, and travelers’ accounts. Lazarre, Jane. 1996. Beyond the Whiteness of Whiteness: Memoir of a White Mother of Black Sons. Durham: Duke University Press, 2016 (Twentieth anniversary edition). A memoir that recounts the author’s confrontation with her own racism and explores “the possibility of rejecting willful innocence and persistent ignorance of history, of being oblivious…to the history and legacy of American slavery….” (p.xvii). Jacobson, Matthew Frye. 1999. Whiteness of a Different Color: European Immigrants and the Alchemy of Race. Cambridge: Harvard University Press. Using novels, films, journalistic accounts, court records, legal codes, congressional debates, and many other primary sources, Jacobson writes about race as American history. Like Brown, above, he starts in the colonial period, but moves from there into the twentieth century. He maintains two points: “race is absolutely central to the history of European immigration and settlement” (p.8), and “race resides not in nature but in politics and culture” (p.9). The history of “whiteness and its fluidity is very much a history of power and disposition” (p.9). Thandeka. 1999. Learning to Be White: Money, Race, and God in America. New York: Continuum. No one in born white in America. The first racial victim of the white community is its own child. Racist acts are sometimes not motivated by white racist sentiment but by feelings of personal shame. Smith, Chip. 2007. The Cost of Privilege: Taking on the System of White Supremacy and Racism. Fayetteville, NC: Camino Press. The author argue that the “system of racial preferences [in the United States] is the main barrier to forming a broad movement that can fundamentally transform U.S. society.” The last section of the book is focused on “Taking on the System” and includes ten ways people can challenge white supremacy during an ordinary day (ch. 24). Daniels, Jessie. 2009. Cyber-Racism: White Supremacy Online and the New Attack on Civil Rights. New York: Rowman & Littlefield. White supremacist groups were early adopters of the Internet to get their message across, so it’s important to understand their tactics and methods. The author uses scholarship to understand white supremacy online and activism to combat it. Leonardo, Zeus. 2009. Race, Whiteness, and Education. New York: Routledge. Following Peggy McIntosh’s “White Privilege: Unpacking the Invisible Knapsack,” Leonardo creates a “selective list of acts, laws, and decisions, if only to capture a reliable portrait of white supremacy” (p.85-89) in his discussion of how children learn about whiteness in both their formal and informal education. Bush, Melanie E.L. 2011. 2nd ed. Everyday Forms of Whiteness: Understanding Race in a “Post-Racial” World. New York: Rowman & Littlefield. Using extensive interviews conducted at Brooklyn College in the late 90s, Bush examines the assumptions of white students and determines that they are uncritical about their racial identity and accept it in an unexamined way, and are largely blind to the racial inequalities around them. Lightweis-Goff, Jennie. 2011. Blood at the Root: Lynching as American Cultural Nucleus. Albany, NY: SUNY Press. Writing as a Northerner, this book reminded me that lynching was not limited to the South. The description of the author’s 2008 experience in Port Jervis, NY is hair-raising, and equally upsetting is the reminder that no evidence of a lynching there in 1892 could be found. Berger, Martin A. 2013. Freedom Now! Forgotten Photographs of the Civil Rights Struggle. Berkeley: University of California Press. This collection of photographs aims to problematize the canon of Civil Rights photos that we often see in circulation. Traditionally, the photos depict African American suffering and White activism. These photos suggest that there’s another side to the story, and that when we “go to the source” we should make sure we look at as many of the sources as possible. hooks, bell. 2013. Writing Beyond Race: Living Theory and Practice. New York: Routledge. Although not a self-help book by any means, bell hooks provides helpful strategies for ways to combat white supremacist thinking (which she prefers over the term “racism”). Primarily, be self-conscious about the types and amount of media you consume! Simien, Justin. 2014. Dear White People: a Guide to Inter-Racial Harmony in “Post-Racial” America. New York: Atria. Written by the writer of the movie of the same name, the graphic satire is a guide to avoiding microaggressions. Sullivan, Shannon. 2014. Good White People: the Problem with Middle-Class White Anti-Racism. Albany: SUNY Press. If you’re white like I am, you have most likely asked the question, what can I do to promote racial justice and/or eliminate racism or white privilege? It’s a good question with some really difficult answers. The author focuses on liberal white racism and its intersectionality with class bias. It’s a hard, but important, examination of the racism of white middle class anti-racism. Coates, Ta-Nehisi. 2015. Between the World and Me. New York: Spiegel & Grau. Hochschild, Arlie Russell. 2016. Strangers in Their Own Land: Anger and Mourning on the American Right. New York: The New Press. Kendi, Ibram X. 2016. Stamped From the Beginning: the Definitive History of Racist Ideas in America. New York: Nation Books. In contrast to the “popular folktale of racism: that ignorant and hateful people had produced racist ideas” (p.9), Kendri offers a counter-history: that “racial discrimination led to racist ideas which led to ignorance and hate” (p.9). He examines the thinking of five important figures: Cotton Mather, Thomas Jefferson, William Lloyd Garrison, W.E.B. DuBois, and Angela Davis. A (not so) fictional account of the experiences of Black students at an exclusive predominantly white institution of higher learning. An African American man meets his White girlfriend’s family. This entry was posted in collection highlights, events and exhibitions, libraries by trwrightmauer. Bookmark the permalink.